The monarch butterfly is in a world of hurt. Right off the bat it has problems because it's so unique; it's a migratory insect that flies thousands of miles to survive winter, then returns to continue life in northern latitudes—and they travel right through our neck-of-the-woods. Everyone knows birds migrate and do it in astounding numbers, astounding ways and astounding distances. They're built for it. Some shore birds stop for refueling in Oregon (Lake Abert was one of the places, but it's dead now) and then make the next hop of their flight non-stop to South America and return the following spring—but an insect? A butterfly? Unlike the monarchs of the East and Midwest that migrate about 2,000 miles and spend winter in Mexico, the monarchs we see spend winter in and around San Francisco and Santa Cruz in California, down to the coast of northern Mexico, and summer in Arizona, Utah, Nevada and British Columbia, Canada. 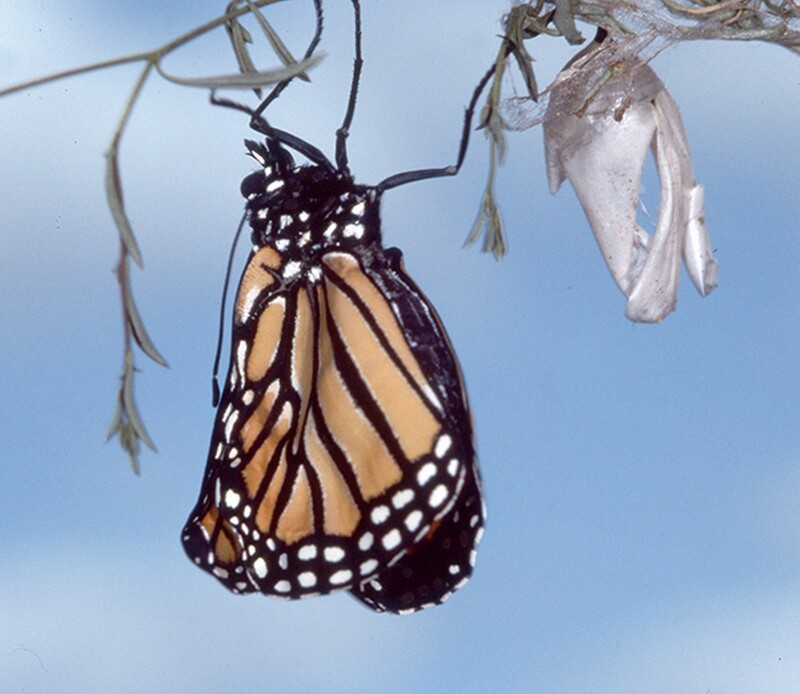 Unlike a bird, when the monarch begins its voyage back to its summer haunts, the individual never gets there. 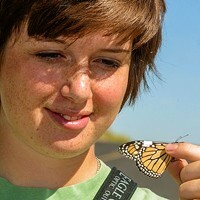 Monarchs go back north by generational progress. To do that—to survive as a species—they must have the plants to produce the next generation of monarchs to continue the voyage north, and there is only one type of plant they can use: milkweed. That's where you, me, and the rest of human society along the monarch's flyways come into the picture. We must supply them with not only the milkweed, but the nectaring plants as well. I say, "must," because it's we humans who have destroyed—and are still destroying—the habitat monarchs must have to survive on Earth. We can establish Monarch Waystations. In times past, especially in farming communities, milkweed was abundant and found along roadsides, cornfields, and hay fields throughout the good old U. S. of A. But as Bob Dylan reminded us, "The times, they are a changing." Farmers didn't like milkweed, it was not good for cows and therefore had to go—and it went—along with millions of monarch butterflies. And habitat destruction is still going on today. Even the National Park Service—charged with protecting our nation's natural resources—is destroying monarch habitat as we speak. Lava Beds National Monument in Northern California has narrowleaf milkweed in abundance, a great deal of it growing alongside the roadway where it gets irrigated by annual rain and snowfall. Yet, the highway maintenance crew (wearing blinders, I suspect) sprays and mows the milkweed, killing larva, to maintain "highway standards." There's a petition with more than 38,000 signatures circulating in the US Fish & Wildlife halls of science asking for protection for the monarch butterfly. If the government scientists find the monarch is going downhill so fast it may not recover without drastic action, it may be placed on the Endangered Species list. To prevent that from taking place, citizen scientists and those who just love the sight of monarchs going by have to take action, and Monarch Waystations will make a big difference. And it's not very difficult. All you have to do is pick out an area in your front or backyard, corner of your kitchen garden, or picnic area where you'd like to see monarch butterflies stop on their way north and south, or better yet, spend the summer with you. The area you set aside will be known as a Monarch Waystation. Run on down to Tumalo Gardens, or Wintercreek Nursery over by the U.S. Forest Service headquarters and you can purchase everything you need to begin your very own Monarch Waystation on your very own property. You can also contact Monarch Watch (Shop.MonarchWatch.org.) for seeds and other monarch supplies. The more people who take on this project the less chance the monarch will end up on the Endangered Species List, the better chance for the butterfly to survive, and the more joy you will have when that magnificent insect grows from egg to adult—that in itself is quite a show. Here's all you'll need: showy milkweed (asclepias speciosa) and/or narrowleaf milkweed (asclepias fascicularis). Narrowleaf will grow in this area, but the showy milkweed will often do better, with adequate irrigation. The following list of nectaring plants is just a suggestion; some of you master gardeners know more about what you can grow and enjoy than I do...and yes, hummingbirds will also enjoy your efforts: blue Sage (salvia farinacea), chia (salvia columbariae), scarlet sage (salvia coccinea), tithonia torch, Mexican sunflower (tithonia), and zinnia/dahlia mix (zinnia elegans). If you have any questions, suggestions, or just want to share what you're doing—or about to do—to insure survival of the monarch butterfly, feel free to send me an email: jim@northwestnaturalist.net.